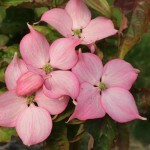 This is a cross between Cornus kousa and Cornus nuttalli. It has stunning pink-red bracts. It is a well branched, floriferous, full tree, that is disease resistant. The fall color is a burnished red. It will grow best in full sun to part shade, in well drained soils.